Building skills to increase influence is one of the top skill sets on which employees request mentoring. In June, Dana Henry led a session on Influencing for Impact to approximately 130 conference attendees. The foundational approach for teaching people to improve their influencing skills is to help individuals increase their flexibility in how they approach influence situations. The model does this by first helping individuals understand the bases of power that are available to them. Additionally, the power available to you is based on the perspective of the individual you are trying to influence. Relational: How much the individual knows, trusts and likes you. Resource: How much the individual values resources that you have under your control. Expertise: How much the individual knows and values the expertise (your knowledge and skills) you bring to the table. Position: The positional power you have over the individual based on the organization’s hierarchy. Partner: Work together collaboratively, maintaining a joint goal as well as consciously building the relationship. Coach: Guide and help clarify someone’s thinking/actions. Captivate: Energize and ignite a person to action. Negotiate: Engage someone in a process of give-and-take. Sell: Persuade someone to accept your ideas by positioning benefits in the context of their ”what’s in it for me?” proposition. Direct: Direct someone to take action. 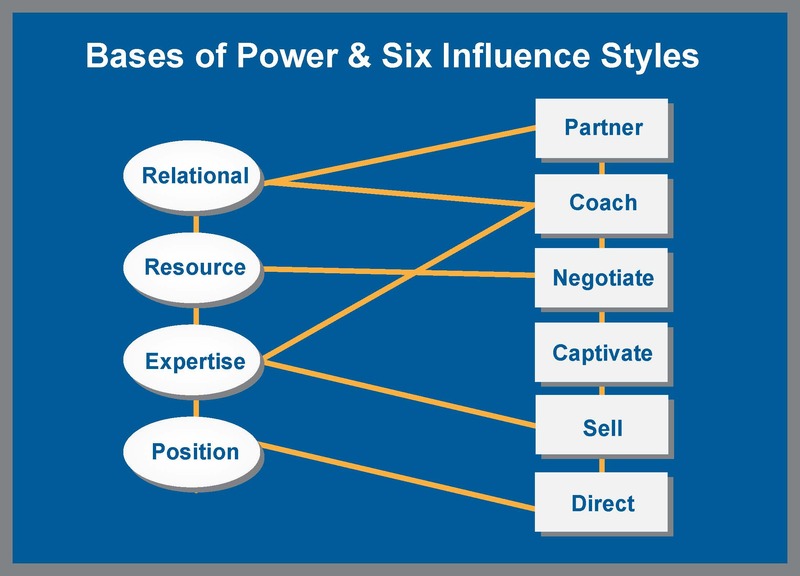 The model to the right shows the relationships between using a specific basis of power to effectively leverage one or more of thei Influence styles. For example, if your targeted person believes you have expertise that they value, then you should be able to utilize the “selling” influence style.. Likewise, if the targeted individual believes you have resources that they value, you may be able to leverage a “negotiation” style of influence. Please contact Dana Henry for more information.